The Genus Acis was only split from Leucojum – summer snowflakes – recently. Both are related to the much-loved snowdrops but differ in that all the perianth segments (petals) are similar. In Galanthus the outer three are markedly different to the inner three. Whereas snowdrops have a devoted following of galanthophiles with hundreds of named cultivars, Acis and Leucojum are somewhat neglected and deserve to be better known. Leucojum aestivum can in fact be found rarely in damp places in Ireland. It is often an escape but it considered a native in some places in the south. That and Leucojum vernum are often seen in gardens here and are robust and beautiful plants that thrive in wet places. The Genus Acis is not seen so often. The species comes from around the Mediterranean and unlike Leucojum do better in hot summers that bake the soil. 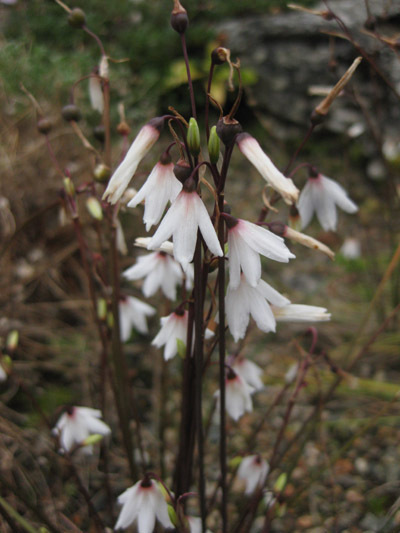 The only one that does well outdoors with me is Acis autumnalis, which is indifferent to soil types. I have it in boggy areas and also in raised beds. 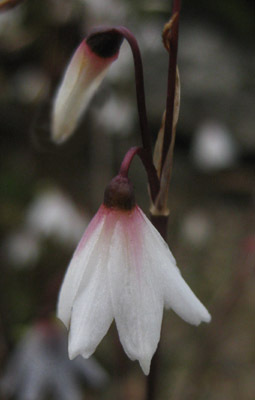 The dwarf white bells with a rosy hue at the base have an elfin quality and two or three flowers may be borne on a single 6/8 inch stem, usually before the grass-like leaves appear. Coming into flower in August they are a welcome addition to any rock garden and it is easily raised from seed (I raised mine from AGS seed). If it has a fault it is that the leaves become untidy but a little judicious tidying up now and then sees to that. There are three or four other species. Acis rosea is equally desirable but only bears a single rosy hued flower on each stem, so rarely makes any impact. It requires perhaps hotter conditions to thrive, although it survived outdoors with me last winter, so is best in the greenhouse. It too is dwarf.